The headline says: Tarrant County investigates bogus election flyers. But the ugly backstory is that the official-looking but phony flyers were found in a heavily Hispanic area and were aimed at suppressing minority votes. They had an official-looking seal and stated that election day had been changed to Saturday (instead of Tuesday). If a voter acted on this mis-direction they would find out that the election was over and they were out of luck. There is an investigation underway but my prediction is that the culprit(s) will never be found, much less found guilty in a court of law. Elections Administrator Steve Raborn said there’s no way to know how many fliers, which were in English and Spanish, were distributed. “It’s discouraging if someone is trying to suppress the vote rather than encouraging people to vote,” Mr. Raborn said. Cybercrimes may have occurred in recent elections. There have been frequent suspicions but no conclusive proof. Now it is possible that ever more sophisticated schemes may be used to skew election results. This should be required reading for all candidates and their staff. But the focus is usually more on creating a new direct-mail piece or tv commercial. The web may not deserve its reputation as a great democratic tool, security experts say. 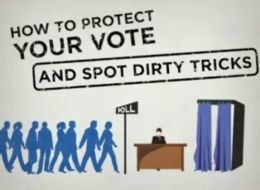 They predict voters will increasingly be targeted by internet-based dirty tricks campaigns, and that the perpetrators will find it easier to cover their tracks. While politicians have been quick to embrace the internet as an enabler for democracy, established security threats like spam emails and botnets – collections of “zombie” computers remotely controlled by hackers – all open new avenues for fraudulent campaigning. So said experts at an e-crime summit at Carnegie Mellon University in Pittsburgh, Pennsylvania last week. Dirty tricks are not new. On US election day in 2002, the lines of a “get-out-the-voters” phone campaign sponsored by the New Hampshire Democratic Party were clogged by prank calls. In the 2006 election, 14000 Latino voters in Orange County, California, received letters telling them it was illegal for immigrants to vote.